This month’s mandala feels like a call to action, which seems appropriate for the beginning of the year when we tend to make new year’s resolutions. I find it’s one thing to make a resolution and another to follow through on them. In a recent email I received, it stated that until we actually commit to doing something, we’re basically standing at the doorway with one foot in and one foot out. I’d like to offer another option…how about we strive to find a way to do a little better today than we did yesterday. So rather than having 4 servings of carbs in one day, make it 3 servings. If we did ten reps of weight resistant exercises last week, do 12 reps this week. If we remembered to give a smile to 3 people today, then give 4 tomorrow. We have 366 days this year so spread it out. Keep it simple and easy…baby steps. Come January 1, 2013 we will be way ahead of the game and in a much better place than we were today. I heard Dr. Phil tell a guest once that January 1 rolls around every year regardless of what we do or don’t do. So would your rather be better off or worse off when it comes around again? It’s your choice…it’s our choice. When struggling with what colors to use, try using complementary colors or a variation of the complementary color. So if you have a lot of blue in your piece, add some orange. Too much pink? add some version of green. 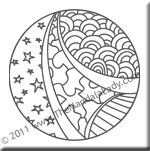 Please feel free to share your experience with coloring this month’s mandala. I’d love to hear about your progress and/or see an image of your coloring. Be sure to download/color Section 1 of the 2012 Mandala of the Year.